To address chronic back pain, ask your doctor about spinal cord stimulation therapy. Although it’s not for everyone, it’s a minimally invasive procedure that can supply long-term pain relief. Spinal cord stimulation from a sports and pain physician in New York City works through an implanted device that overrides the pain signals. 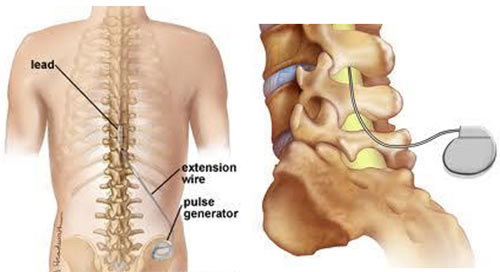 Like a pacemaker, a spinal cord stimulator works continuously with minimal inconvenience. Come to our pain management and sports injury clinic to get your back pain evaluation and treatment. Meet our pain doctor Febin Melepura M.D. the best rated back pain specialists in NYC. Living with chronic back pain brings with it many other physical and psychological side effects. When you’re in constant pain, even if it’s just a dull ache, it affects how you approach your day, how much you can participate in daily activities and how you feel about yourself. If you’re experiencing chronic back pain, see your sports and pain doctor in Midtown Manhattan for effective pain relief. Usually, your physician starts with conservative treatments – such as over-the-counter medicine, physical therapy or a nerve block injection – to resolve your pain. But if it continues and your doctor determines the cause is nerve damage, you may be a candidate for spinal cord stimulation therapy. While far from a radical procedure, spinal cord stimulation does require several minimally invasive surgeries, including one to place a trail device. If any of these situations apply to you, you may benefit from a spinal cord stimulator. This procedure doesn’t cure your condition, but it does mask the pain so you can live your life pain-free. Deciding to have the procedure isn’t a rash decision, but one that you reach after a clear conversation with your NYC doctor. Spinal cord stimulation therapy involves implanting a wire underneath your skin next to your spinal column, at the point of your pain. After a successful test to make sure the device works for you, you can receive the permanent device, which your doctor places under your skin just above your buttocks. The battery-operated device sends electrical impulses to your spine, which hides the pain signals. The device usually functions all the time, although you have an external controller to program the signal intervals. You can use the controller to turn the device on and off, too. If your device has a non-rechargeable battery, it needs to be replaced about every three years in another minor surgical procedure. Rechargeable batteries may last up to 10 years, but you have to recharge it daily. Temporary wire leads are inserted surgically into the epidural space that’s behind your spine, using a fluoroscope to guide the wire and a thin needle to place it. The wires exiting your skin are sealed with a bandage to keep it clean. Connected to the wires is an external stimulator that you control. You wear the test device for about a week, after which time, you have a follow-up appointment to remove the temporary leads and assess the results. Again using a fluoroscope, your NYC pain doctor places the permanent lead wires into the epidural space where they worked for the trial run. Your physician implants the stimulator device, an implantable pulse generator that’s mostly a battery, under your skin above your buttocks. The device is small enough to not be noticeable. The entire procedure takes between one and two hours. The small incisions are sealed, and before you leave the office, the device is tested. You receive an external controller with which you can adjust the power levels and switch it on or off. While the procedure itself is painless, for the most part, carrying the device can be a bit uncomfortable at first. But if it works, you’ll consider the inconvenience worthwhile. The device is removable in a separate surgery, but you may not desire that if it’s working as well as the test device. Do you have any questions about the spinal cord stimulation therapy treatment for back pain we offer in NYC? 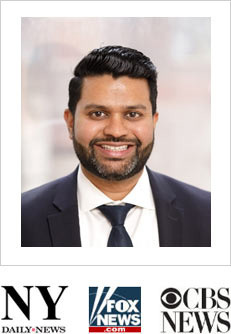 Would you like to schedule an appointment with the best rated back pain doctor Febin Melepura MD of sports pain management clinic in New York? Please contact our office for consultation with the pain relief specialist in Midtown Manhattan.